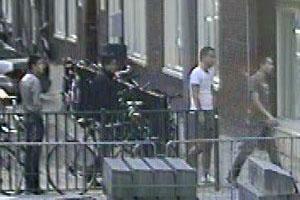 The Amsterdam police published photos of a group of youth who threatened to kill a man in Amsterdam-West last August because he did not fast on Ramadan. The group shouted at the man that they'll shoot him in the head, the police reported Monday. The man was called a 'filthy homo who doesn't comply with the Ramadan". The youth also told him that they've been very clear and that next time they'll catch him and kill him 'after which you'll go to hell'. The police tried solving the case on their own, without success. They did not publish the photos earlier because for privacy reasons they don't put everything on the internet, according to a police spokesperson. It's unclear whether this is a homophobic crime. "That they called him 'gay' doesn't mean that he is. For us it doesn't matter in any case if it is or not. What these people did is criminal and therefore they must be caught." Belgium: "No more cash for asylum seekers"